The R&S®SGT-K540 option Envelope Tracking is a powerful and versatile solution to characterize DC modulator chipsets in conjunction with envelope tracking power amplifiers. Any user I/Q (ARB) waveform can be used. 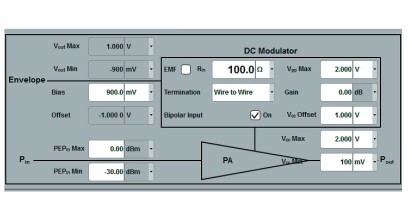 Envelope tracking is a technique to increase power amplifier (PA) efficiency by modulating the DC supply voltage according to the envelope of the IQ signal. For test and verification of DC Modulators and Envelope tracking power amplifiers (ETPA) several measurement challenges occur. At the PA a high-precise synchronization between the envelope and the RF signal is required. To avoid additional noise introduction best spectral purity for the envelope signal is needed. In addition envelope shaping is applied to get a trade-off between efficiency and linearity. For level sweeps and PA dynamic range tests automatic recalculation of the Envelope signal is required. The R&S®SGT-K540 Option Envelope Tracking provides solutions to all of these challenges. It enables the capability to generate the envelope of any IQ data in real time and output it at the analog interface with highest spectral purity. As RF and Envelope is generated within the same instrument, no additional cabling for synchronization is required and no added jitter occurs thus 100 % repeatability is provided. The RF to envelope delay adjustment can be performed in real-time within ps resolution. 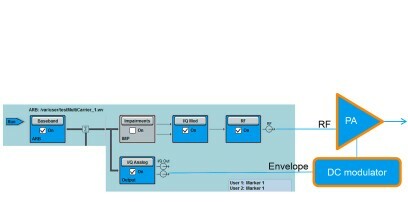 Several envelope shaping capabilities (i.e. table, polynomial, detroughing) are also implemented. A unique feature of the R&S®SGT-K540 Option is the automatic envelope voltage adaption for simplifying the setup and avoiding time consuming adjustments for different power levels.